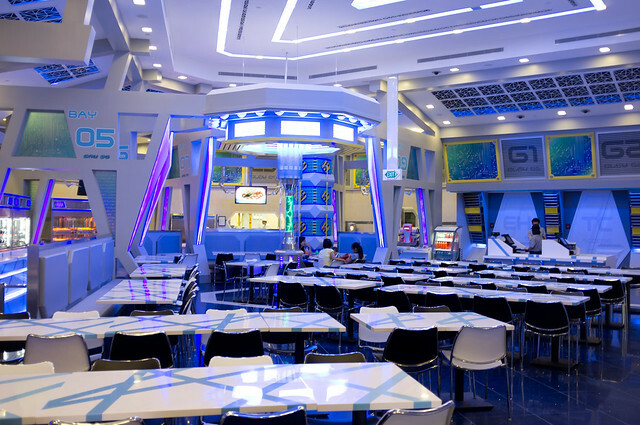 With streaks of blue lighting and unusual diagonal forms, this cafeteria style restaurant is bizarre, yet inviting. The floor is divided into two areas: a large indoor seating area, and a queue lane that wraps around the edge of the cafe. It’s kind of like IKEA’s restaurants. 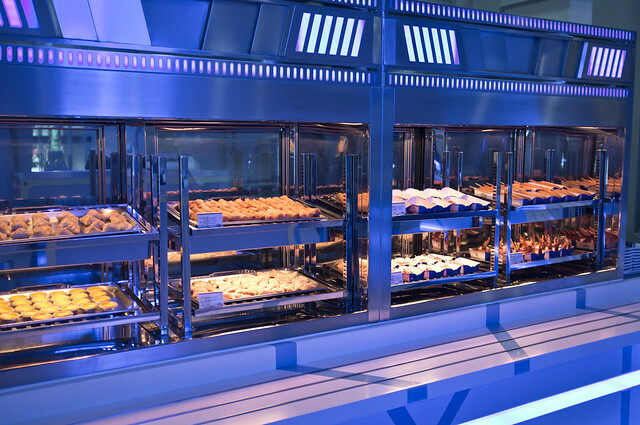 Here is an almost complete list of food offered at Starbot Cafe. Do note that F&B outlets in Universal Studios Singapore change menus all the time, and the restaurant rotates options for the entrée and snacks. I’ve also noted down the starting price for each section. EDIT: I’m afraid to say that this restaurant is not Halal certified. There are some dishes with pork and the Yakitori sticks have bacon. Apart from all that’s stated, the restaurant also sells soft drinks (in disposable and souvenir cups) and non-alcoholic mixed drinks in souvenir glasses. 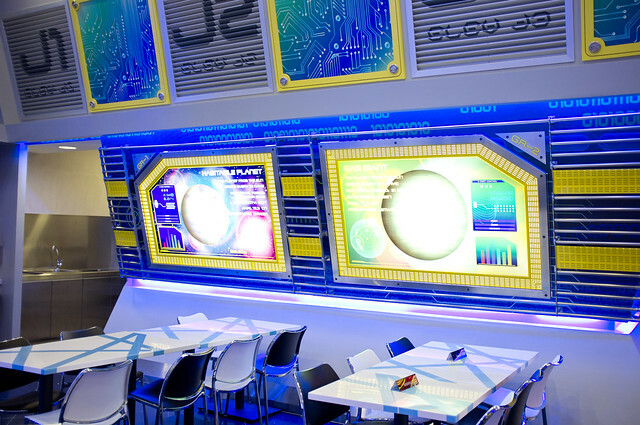 Starbot Cafe is what I feel to be Universal Studios’ equivalent of the typical restaurants at Tomorrowland, specifically the Starliner Diner at Hong Kong Disneyland. 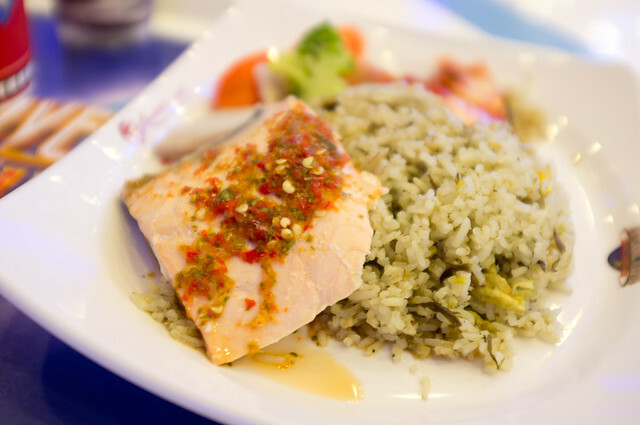 The meal combos are reasonably priced – the food portions are generous and filling, unlike typical theme park food offerings. They also seem healthier, with a good dose of greens and rice. To keep your taste buds excited, the meals also include a small appetizer on the side: achar or kimchi depending on your luck. While my friends and I enjoyed the main courses, we found that the fried side dishes (or side winders) to be very oily. The layout of the restaurant is also very cramped and the whole restaurant gets crazy during noon and in the evening. Unfortunately with the next big thing happening next door, the park can’t set up tables outside. I would recommend that parents with strollers to park them outside the restaurant for the convenience and safety of other patrons – ask the park crew for a child’s high chair. 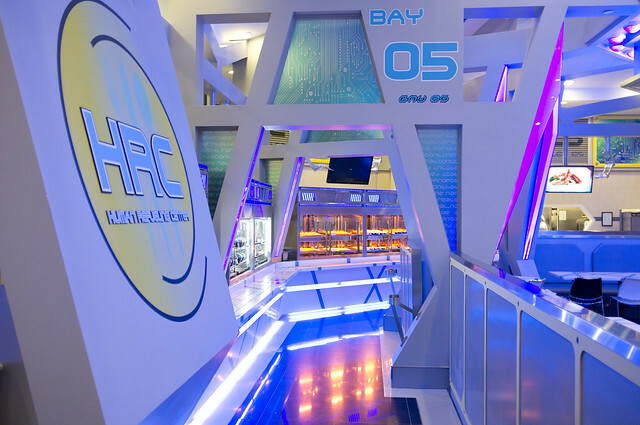 And if you feel like dining at Starbot Cafe during the high peak periods this holiday, be sure to plan your meal times – the cafe is usually filled to capacity from 11:30am~2:30pm and 5:00pm~6:30pm. Omg is this place halal because I want to try the Beijing duck maki LOL and what on earth is this – Sci-Fi Flavoured Lemon Grass Jelly haha?? Hi bb! Unfortunately, this place is not certified Halal. That’s so great! I’m gonna eat tomorrow here. Good to hear that it’s not Halal certified!! !